Finding ways to ensure users can simply and easily understand extremely complex and detailed services within a stressful operations environment. My work within this space included design mocks, prototype creation and testing, quantitative user testing, results analysis and delivery. 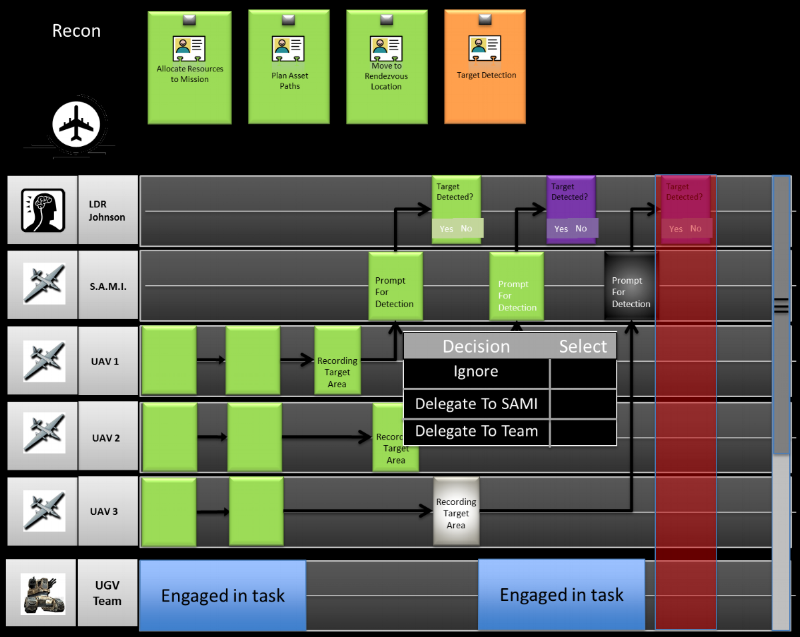 This work and final interface helped to form the foundation of a variety of decision making and allocation services produced by Perceptronics. Conceptual wireframes and explanation of process for the to-be-developed decision making interface. Simplistic prototype used to test and validate the service as well as an operator's ability to leverage and understand it's content. A service devoted to data collection and dissemination in a highly mobile and connectivity-sparse environment. Intended for epidemiological data collection and first responder coordination and documentation. To accomplish this application's deployment, an extensive series of information gathering sessions, design iterations and user testing experiments were employed. Prototype display diagramming the mobile data collection tool: AREA. This tool went through an extensive design and testing process to ensure the data was rich, accurate, and accessible to a niche and extremely technical group of users. Proposed mobile application design intended for deployment to the app store. 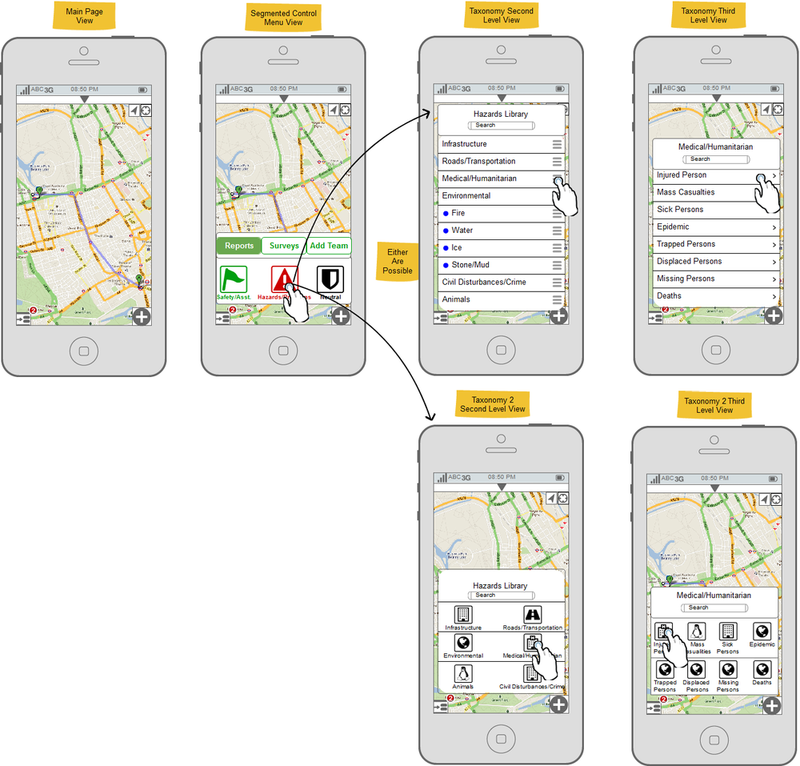 The desktop extension of the AREA mobile application. This service suite allows coordination of data collection and assistance efforts. Desktop operators can oversee operations and provide higher level assistance to those on the ground. Services devoted to team planning and strategic maneuver management. Interface intended for primary mission planning and communication deployment mechanism. The interface shown is one of a multitude of the wireframe variations proposed for deployment. One of many iterations of a platform devoted to multi-process, multi-asset mission planning and execution services. This tool works with decision making and modeling services by applying statistical inference to mission planning and deployment strategies. Scenario driven, multi-unit control and command training simulation software. Modular, highly responsive and extensible. Within this simulation suite, multi-stage and multi-asset scenarios could be tested and evaluated to ensure mission excellence prior to real-world deployment; of course, many of these scenarios were or are highly unlikely to exist with current technological capabilites. This simulation platform was designed to reduce theoretical operator workload when attempting to manage and manipulate greater than 50 remote mobile assets. It allows for a wide variety of simulations to be created, imported and run for evaluation and post-mission analysis. Providing monitoring and analysis services to better understand how the social media landscape undulates and to identify key insights for social media campaigns. This service was designed to help users better understand how to better reach their audience and capitalize on it. With this platform, operators are able to analyze, postulate and execute social media campaigns based on real-time social media data analysis. This screen is an early consideration for the type of information to be displayed and available for operator manipulation. Hypothesis driven simulation services designed to test and plan for various disaster scenarios and how to best respond to them. An early iteration of the planning and allocation interface showcasing the multiple inputs, assets, and data points necessary for field operation. Detailed and designed resource management interface. This version includes more robust simulation services and live back-end data services for simulation analysis. Lead research and design efforts on multiple SBIR (Phase I, II, and III) - Contract grant values ranged from $150,000 to $5 million dollars. Authored and delivered monthly and bi-monthly SBIR progress reports. As a result Perceptronics maintained contractual obligations to grantors elevating and extending contracts. Determined criteria for hiring new User Experience designers and researchers. Mentored and managed User Experience design and research interns.